A groundbreaking approach to selling in a world demanding change Leaders, sales managers and professionals have found themselves stuck at a crossroads between the past and the future of selling, and they need a roadmap to help them embrace the challenges they face at such a critical juncture. 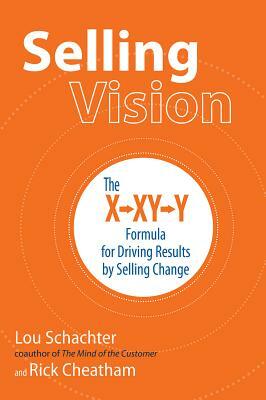 Selling Vision is a step-by-step guide to creating and selling change. By implementing new change management strategies into their unique X→XY→Y selling methodology, the authors: - Propose a new logic for thinking about and executing major sales transformations - Examine these transformations from the customer's perspective and how their changing buying patterns suggest a particular way of focusing selling activities - Consider the perspective of salespeople and what they can do to sell change to their customers - Look at how sales leaders and managers can change the way their organizations sell products or services- Highlight the pivotal moments that determine the success of major change initiatives Based on their unique X→XY→Y selling methodology, Schachter and Cheatham provide a proven sales strategy to help any sales leader, manager, or professional. For sales leaders, their approach provides a path for transforming the sales organization. For sales managers, it describes how to inspire change in the behavior of salespeople. And for salespeople, it offers a new way of selling that will have a dramatic impact on their performance. For any business executive, Selling Vision provides a faster path to driving change. This book provides immediate actions you can take and experiments you can conduct to find the right direction for future sales efforts at any level of an organization. How you respond to changing sales dynamics will determine your company's success, that of your customers, and, to a great extent, your own personal career goals and future. Lou Schachter is managing director of the global Sales Practice at BTS, where he is responsible for ensuring client success and the growth of the practice worldwide, leading the 30-person global practice team, and driving thought leadership. He is the co-author of The Mind of the Customer. Rick Cheatham leads the Sales Practice at BTS for the United States. As a thought partner for organizations who want to transform their sales teams, Rick has worked with clients such as Google, Salesforce, and IBM to accelerate the execution of their sales strategies and transform their sales forces from transactional to consultative.